Check the Food Channel For Great Holiday Ideas this Season! Chef Joel Harrington, opening chef de cuisine for Fearing�s Restaurant in Dallas, will introduce his �True American� cuisine at CORE Kitchen and Wine Bar this Friday, combining American restaurant classics of the past 50 years with the vibrant flavors and colors of Arizona�s Sonoran desert. The result is a brightly-flavorful new menu blend of savory, salty and sweet, enlivened by such ingredients as maple syrup, Japanese snack mix, pecans, Sherry vinegar, corn tortillas, mesquite flour, avocados and Sriracha. The contemporary, multi-venue CORE Kitchen and Wine Bar is the culinary anchor for the new Ritz-Carlton, Dove Mountain, and features several unique settings offering an array of dining experiences where Harrington�s accessible menu will take center stage -- and where local and regional ingredients, some of them rare or custom-grown, will help to create a new kind of desert dining experience. In today's unsteady job market, its rare to hear the tale of a career that spans a quarter century in the same industry, let alone the same company. But Chef Manny Topinio's story is merely a chapter in his illustrious life, as he has spent the past 25 years creating palatable delicacies for Marriott, most recently as the executive chef at the company's Marina del Rey hotel. Now, Topinio is readying himself for a move to Maui, where he spent the better part of the '90s creating delectable Hawaiian regional cuisine at Marriott's Maui Ocean Club resort. "Things just came easy to me," Topinio says of his introduction to cooking, which began at the backyard barbecue of his childhood home in Orange County. Topinio would help his father marinate meats for family meals and soon found himself with a culinary itch that begged to be scratched. In 1984 after attending junior college and culinary school in Southern California, the budding gourmand landed a job as a prep cook at the Anaheim Marriott. And while working on an assembly line to create 1,200 sandwiches on his very first day of work, Topinio had second thoughts about his chosen career. "I thought wow, is this what I really want to do?" he recalls. But even the most mundane, monotonous culinary task proved exciting enough to stick with his passion. "Then I remembered, I really love to work with food." 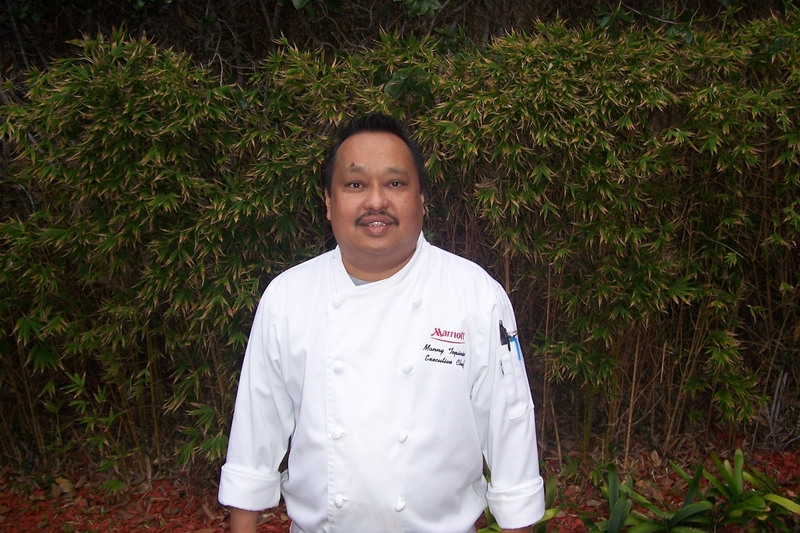 That love of food helped Topinio rise through Marriott's ranks, eventually manning the hotel's omelet station and cooking for the property's bustling banquet business. And in 1992 Topinio left Southern California for an even sunnier locale--Marriott's Maui Ocean Club. It was there that he explored local flavors and ingredients, including Mahi Mahi, exotic snappers and even wild boar--one of his favorite types of game to work with. Soon Topinio found himself in charge of the property's sushi bar, affording him an entirely new skill set. During his tenure at the hotel, creative original dishes such as braised petite osso bucco garnered notoriety from the Honolulu Star-Bulletin and "Hawaii's Kitchen," a television show on the island's local Fox affiliate. By the time Topinio left Maui to return to Southern California in 2005, he was the Ocean Club's executive chef of cuisine. He began with the same title at the Marriott Marina del Rey that same year, and hasn't put down his spatula or frying pan since. And while Topinio is saddened to leave the staff that he considers a second family he is excited for what lies ahead in Maui. "Its about the challenge," he says. So perhaps Topinio is ready to throw in his chef's hat and start a new chapter in his book of career? Not quite yet. He says strongly, "I'll never stop cooking." 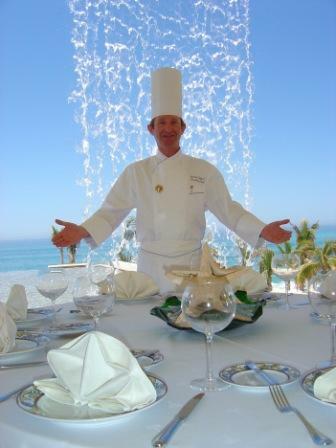 Marquis Los Cabos� Executive Chef, Maitre Cuisinier de France and Vatel Club of Mexico President for over 10 years, Thierry Dufour was one of three chefs in Mexico recently awarded the prestigious 2009 �San Pascual� for lifetime achievement and contribution to Mexico cuisine. The �San Pascual� was established as an homage to Mexico chefs who excel in the field of gastronomy and whose dedication to the study of hospitality cuisine is exemplary. A commemorative bronze plaque engraved with Chef Dufour�s name was also added to the Explanada de la Fama (Hall of Fame) for chefs, located adjacent to the bronze sculpture of St. Pascual Bailon (the patron saint of Mexican cooks) created by the famous Mexican Sculpture Ramiz Barquet, on El Malecon in downtown Puerto Vallarta. The award was presented by the American Academy of Hospitality Sciences in conjunction with Visa and the International Gourmet Festival on November 17th as part of the Festival, in its 15th year, held in Puerto Vallarta and Riviera Nayarit, Mexico. Thierry Dufour has been an executive chef for over 18 years, earning his Michelin �pedigree� (one of the highest culinary honors in France) while working at a two-star Michelin restaurant and attaining the prestigious Master Chef of France title. In addition to being the executive chef at Marquis� signature restaurant, Canto del Mar, which has repeatedly been honored with the Five Star Diamond Award by the American Academy of Hospitality Sciences, Dufour has played an active role in organizing Baja California Sur�s Rhythms, Colors and Flavors of Los Cabos held in December.